I was more than surprised to find Palstar showcasing a transceiver at the 2013 Hamvention. Palstar is well-known for their tuners and their receiver, the R30A, but they have never sold a transceiver to my knowledge. As you can see from the photos, the Palstar TR-30 has a simple faceplate with a touch screen display. It is all aluminum, thus is very light. 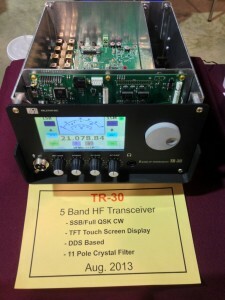 TR-30 is rated for 20 watts PEP and has an 11 pole filter on board. I hope to review one once it is in production. Palstar expects the TR-30 to be available August 2013. 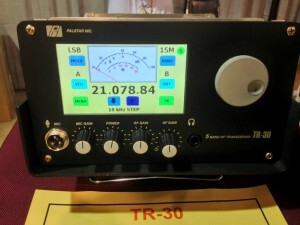 This entry was posted in Announcements, Conferences, Hamvention, News, Product Announcements, QRP, QRP Radios and tagged Palstar, Palstar TR 30. Bookmark the permalink. It is interesting that within the past couple of years, the number of commercial QRP rigs has increased and multiplied. I will add my own gulp to your gulp. Price-wise, most are in the thousand-buck category. KX-3, Argonaut, now Palstar. Who next? Fortunately, kits are still available. Constructors will put them together, at a modest fee, for amateurs who can no longer do so, or are not up to it. I don’t see the FT-817ND going away any time soon. People are complaining about the Argonaut VI being priced at a grand minus 12m & 6m and no tuner. They’re really going to freak out on a 5 band rig at $1,500 to $2,000!! The devil is in the details. This radio has some extraordinary features that are buried in the design. I spent a lot of time with the man behind the radio. (engineer John Keith retired Collins engineer) I was quite surprised amazed actualy) at what has gone in to this thing. I’m pretty sure this isn’t going to sound like any other radio presently on the market… even the $6,000 YaeComWood offerings. Interesting to see that Palstar is entering into the competition. From the little I have read it seems this rig “may” be competition for the Elecraft line since it claims to have superior engineering under the covers. I have had a K1 and now own a KX3 which I built from kit form. In my humble opinion, the KX3 is a superior product in every way. I do hope the Palstar TR-30 finds a home in the market. Competition from an source, if proven to be a viable alternative will help drive down the price of these high quality QRP rigs. i hope that in the future Ten Tec would to use Beagle Board than Arduino, more flexible to any project. GNU General Public License for multi architectures (multi arch).